Posted by Dave Emory ⋅ December 17, 2018Post a comment Email This Post Print This Post Tweet This! Good Evening, Mr. Bush! I’ll Be Your Server Tonight! COMMENT: Exemplifying the grotesque, orgiastic hagiography to which the media have been subjecting us since George H.W. Bush died is a reputed conversation between the dying George H.W. Bush and Dubya, as reported by James Baker. After speaking to other offspring and relatives, the dying Poppy reportedly spoke with Shrub, who allegedly said: “I’ll see you in Heaven, Dad!” Supposedly, Poppy spoke no more before going on to his Eternal Reward. If, in fact, such a rendezvous does take place, we do not expect it to occur in the Celestial Hereafter. We have extensively covered not only George H.W. Bush but the entire blood-soaked family, from Poppy’s Nazi-backing progenitors to Dubya, who bequeathed us two wars and a depression. This benighted society’s obsessive mantra decrying what it labels “conspiracy theory” has blinded us to the decisive reality of covert operations as a pivotal element of society, as well as sanctioning the categorizing of various fascist conspiracy theories alongside established historical events. In FTR #’s 361 and 370 we highlighted that he came from a family inextricably linked with the financing of Adolf Hitler. In FTR #’s 273, and 435, we highlighted the relationship between the Bush family and the fundamental elements of the remarkable and deadly Bormann flight capital organization. In numerous programs and posts, we have chronicled George H.W. Bush’s profound relationship with Trang web cá cược trực tuyếnthe Nazi wing of the GOP. “Poppy’s” exploits also include his apparent involvement in the assassination of J.F.K. and its cover-up. He was the head of CIA when the House Select Committee on Assassinations operational. CIA headquarters is named for him. In FTR #244, among other programs, we highlighted his role in the assassination attempt on Ronald Reagan. In FTR #’s 896, 897, 898 and 899–among other programs–we highlighted Bush’s involvement in the setting up of the Iranian mullahs to succeed the Shah, thereby helping to destabilize Jimmy Carter’s presidency, setting up an anti-Communist government on the U.S.S.R.’s Southern flank. In FTR #214–among other programs–we chronicled how George H.W. Bush and the CIA concocted the phony oil shortage, helping to destabilize Jimmy Carter and providing the pretext for the Reagan military build-up. That military build-up was supposedly necessary to counteract an impending (and in fact nonexistent) Soviet invasion of the Middle East. It ultimately led to a tripling of the national debt. In FTR #715, among other programs, we underscored George H.W. Bush’s installation of Team B, to inflate the alleged Soviet military threat in direct contradiction of the CIA’s own analysis. The overlapping Iran-Contra scandal and the Iraqgate scandal illuminate “the real George Bush.” In FTR #248, among other programs, we noted that both operations were realized by the networks set up to counter terrorism, which became the Vice President’s personal intelligence service. In AFA programs #’s 29-34, we highlighted the Iran-Contra affair and Bush’s participation in same. Having headed a task force allegedly formed to combat terrorism, there is evidence that he instead used his position to assist drug trafficking. The Bush/Iran-Contra drug trafficking has been discussed in numerous other shows, including FTR #503. Bush’s Vice President’s Task Force on Financial Deregulation led directly to the savings and loan debacle, and part of that affair appears to have been a deliberate attempt to loot the S & L’s in order to channel funds to the Contra support effort. 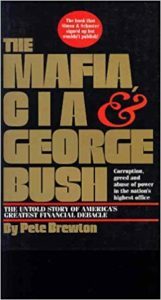 This was highlighted in Miscellaneous Archive Show M43, and Pete Brewton’s remarkable book The Mafia, CIA and George Bush.